In honor of our 30th anniversary protecting the River, we will be sharing stories of our achievements over the years. From tagging horseshoe crabs in Moore’s Beach, NJ to challenging federal agencies like the Federal Energy Regulatory Commission, we continue to work on every level for a clean and healthy environment. Check back each month for a new story! 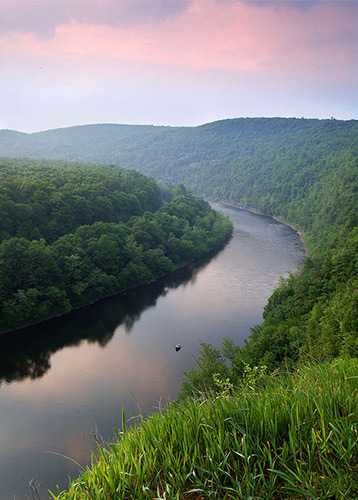 One of the Delaware Riverkeeper Network’s (DRN) biggest watershed victories occurred not too long ago in December 2013 when DRN and seven towns challenged and defeated Pennsylvania’s Act 13. Act 13, also known as HB1950, was signed into law by Governor Corbett on February 14, 2012. This bill amended the Pennsylvania Oil and Gas Act, preempting municipal zoning of oil and gas development. It also established an impact fee on natural gas. In response to this, DRN, Maya van Rossum in her capacity as the Delaware Riverkeeper, Dr. Mehernosh Khan, and seven municipalities filed suit on March 29, 2012 challenging the law on the grounds it violates the Pennsylvania and United States Constitutions and endangers public health, natural resources, communities and the environment. Oral argument was held before the PA Supreme Court on October 17, 2012. The Pennsylvania Supreme Court issued its decision on December 19, 2013. In that decision the Pennsylvania Supreme Court ruled that Act 13 violates the Pennsylvania Constitution on the grounds that it violates the Environmental Rights Amendment. In doing so, the Court held that the right to pure water, clean air and a healthy environment are fundamental rights that must be given high-priority consideration and protection by every level of Pennsylvania’s government. The Court’s decision also struck down the shale gas industry’s effort to force every municipality in the state to allow gas drilling and related industrial operations in every zoning district. The Court’s decision upheld the ability of local governments to protect their local communities and natural resources through zoning. Chief Justice Castille authored the historic majority opinion. Justices Todd, McCaffrey and Baer joined in the result. Justices Castille, Todd, and McCaffrey held that provisions of the law violate Article I, Section 27 of the Pennsylvania Constitution – the Environmental Rights Amendment. Justice Castille stated that “we agree with the citizens that, as an exercise of the police power, Sections 3215(b)(4) and (d), 3303, and 3304 are incompatible with the Commonwealth’s duty as trustee of Pennsylvania’s public natural resources.” In discussing Section 3304’s uniform zoning provisions, Justices Castille, Todd, and McCaffrey agreed that the provisions “sanctioned a direct and harmful degradation of the environmental quality of life in these communities and zoning districts.” They also concluded that the Act forced some citizens to bear “heavier environmental and habitability burdens than others,” in violation of Section 27’s mandate that public trust resources be managed for the benefit of all the people. Justice Baer concurred in finding Act 13 unconstitutional, agreeing with the Commonwealth Court’s reasoning. Justice Baer stated that the provisions “force municipalities to enact zoning ordinances, which violate the substantive due process rights of their citizenries.” He further noted “Pennsylvania’s extreme diversity” in municipality size and topography and that zoning ordinances must “give consideration to the character of the municipality,” among other factors, which Act 13 did not. Following this victory, van Rossum inaugurated the Green Amendment movement, dedicated to empowering every American community to mobilize for constitutional change. In 2017 van Rossum published her book The Green Amendment: Securing Our Right to a Healthy Environment that lays out an inspiring new agenda for environmental advocacy, one that will finally empower people, level the playing field, and provide real hope for communities everywhere.